Craft Business Ebooks. Learning these Online Business Strategies are Easy. Beginning a successful creative enterprise on the web you will need plenty of great written material to study. Info that really delivers the "how-to's" for successful strategy practices online. Just thinking of my own experience tells me that. When I started on the net I dreamed of meeting up with someone who would show me the ropes, as it were. Online you do end up wanting just that kind of thing. So today I will begin by introducing you personally to some great helps in craft business ebooks. In the beginning you will wonder about all the various ways to market you. And these areas can gravitate to how well you know and understand who you are. Next you will no doubt eventually explore the many ideas and directions that you can take. For instance what topic will you choose to focus on. Then as you start making definite plans you begin developing great content about your knowledge in the form of your own personal website. Lastly you work on getting targeted traffic to your ever-growing and exciting-to-you web venture. One hint: don't start a website if it really does nothing for you personally. If you can never see yourself working away at that topic then quit now. I encourage you to not go in a boring-to-you direction. Seriously. To Craft your own Business .. Start Here ..
Getting down to Basics with Craft Business eBooks . . There are a lot of places on the web that seem to know what they are talking about. However, are they definitely geared toward the crafting market? Do they seem to understand the way that you would think? If you're like me here you don't really see people that want to help crafters. Exclusively. Not that there are none. It just seems hard to truly find these people. So what do you do as a crafter? The answer: you try to find other crafters on the web that know how you operate. Also ones who have knowledge and are familiar with craft business ebooks and the resources that you will need. ATTENTION: Get excited about this next piece of info ... These particular volumes outlined on this page are ALL FREE online and you can begin reading them right this very moment. Today you Study the Art of Business not Crafts. Therefore you generally will not see mentioned the word "Craft or Crafters". It is basically my opinion that you can learn from all these craft business ebooks by including you in the chapters. Because they simply deal with using what is in you already to base your own website on. So it really does not matter that you do not see the word crafter mentioned every other page in any book. However you will gain valuable material from all of these craft business ebooks that you can apply to all you do on the net. Make your Knowledge Sell (MYKS) - It is said that everyone of has something worthwhile to say to other people. Yes even you can learn how to produce info products that will sell online. This edition is a resource that will take you by the hand and teach you exactly how to begin doing that. It's a great resource to have. "Other examples... What have you crafted, what did you learn, and what mishaps can you help others avoid? Yes, there are already hundreds of crafters books -- but who needs a huge book on the entire crafting world when they're only looking for the local crafting info you know so well? .... Twenty-seven years old and like to develop unique designer items? Create your ultimate insider's guide to the best designs in town." Italics are my version of this quote found here. "Step by careful step, word by word, paragraph by paragraph, and page by perfectly crafted page, Make Your Words Sell! transforms you into the consummate copywriter who knows how to write to sell. Owning MYWS! is just like having your very own, personal copywriting muse and coach..."
Make your Content Presell (MYCPS) - Another great book to delve into and get all you can from. Learning about web community life should be a thrill to you. Seriously if it is not then why are you here? If you don't really have a passion to learn and explore all you can become then this is definitely not the place for you. The web e-biz life is no different than beginning an offline venture. It is my opinion you should not start either without a heart for it. Or it all becomes drudgery. And nothing is worse than that kind of mentality starting out. MYCPS! is "the anti-hype." Calmly, it shows you how to write about what you know and love. You will understand how to profit from it fairly, full-value for the money you earn." Make your Site Sell (MYSS) - This is an amazingly large volume. Use this craft business ebooks volume and succeed. If ever there was a way to get the feel of being with Site Build It but you haven't joined, this is the way. Read this book. It may take a while but perseverance does pay off. You will really enjoy the thoroughness and the information provided. Make your Site Sell will deliver all that you need as far as the how-to's on the net are concerned. Hope you enjoy the ride. "My goal is to put original, practical, top-quality information into the hands of as many motivated people as possible. Why? Because, for the foreseeable future, the average person can still succeed on the Web. Make your Price Sell (MYPS) - Get the jest of this eBook by taking the introductory Masters Course listed below. You will get the feel of what is in store for you and your e-biz that way. With all of these craft business ebooks you get more and more information to help build your own personal venture. Which is what you want and need. So this volume will help establish in your mind the prices you have to charge to profit from your own e-biz. Make your Price Sell is a software provided on the web. It comes with a manual for exploring exactly what you get when you purchase the software. Knowing how much to charge for anything online is a valuable commodity. So explore this info at length. considering typical customers' "disposable income"
Sound familiar? Most companies mix this "data" together, and somehow magically come up with 'the number.'" Make your Price Sell - The Masters Course - Start the course that goes with this particular craft ebooks volume today. Make your Net Auction Sell (MYNAS) - This book will go along with a thriving enterprise as it gives you insights into working the markets such as EBay or other similar sites. Learning this valuable info will help to make your journey a profitable one. Which is what I want for you too. After all you didn't start this quest of yours to get nothing for your efforts. Make your Net Auction Sell comes as a Masters Course and will teach you such things as how to make EBay work for you and other important ideas. "However, you can build a real e-biz on the web. Yes... you. The Net auction idea is an easy, low-cost, no-risk entry into e-commerce. Use this craft business ebooks volume and succeed. The perfect way to get your "e-feet" wet! And... you will get to meet people from around the world who are as passionate about the same collectible, hobby, subject area, etc., as you are! 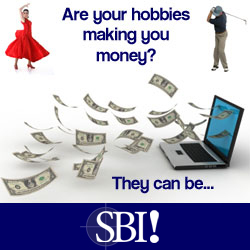 What other e-biz could be as exciting or more personally rewarding?" Make your Net Auction Sell - The Masters Course - Start the course that goes with this particular craft business ebooks volume today. Make your Links Work (MYLW) - Finally you get to building some traffic to your work of art website. All sites need traffic and lots of it if they are to survive. Utilize all of the techniques illustrated in this fine informative eBook. Finally you now have major tools to help your crafting venture succeed. 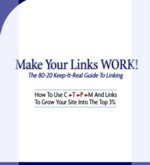 "Make Your Links WORK! (PDF format) shows you what does produce success in the most time-and-cost efficient way possible, now and for the long term. No tricks. No manipulation. No treadmill. MYLW! does more than focus your link popularity efforts on the time-efficient side of Pareto's "80-20 Law." It presents the vital bigger picture required for building targeted traffic (now and for years to come) and for building long-term profits." Now that you have a start at some truly great craft business ebooks you will want to get into all this material. My advice to you is download all the study help ONE AT A TIME ... And then start getting familiar with the resources. I am certain if you have the desire to be here this material will definitely help. The fact that it is all free and right at your fingertips really leaves you with no excuse where starting an e-biz on the net is concerned. As you read it as well what will excite you the most will be that it is all geared toward you, is down-to-earth, real, and is not hyped up. You will never be told that having an online enterprise is a snap or that it is as easy as the get-rich-quick schemes tell you. On the contrary if you are willing to put in the work on your web e-biz you will be told the how-to's that will really help make it possible. Working on the web is just like having a real established enterprise offline. If you work at it, it can pay big time. But if you get lazy then guaranteed you will get just what you put into it. Nothing. So plan today to SUCCEED. Craft Business eBooks and more from this link. And now if you are also excited to begin your own online journey it would be nasty of me not to give you a real way for you to go to the ultimate step and order your own website. After all it will be your own creative venture you will be starting. So great days ahead to you.... and get started here.